This Sweet Potato & Cranberry Kale Salad is perfect for bringing to your next potluck, stored in your refrigerator for lunches throughout the week, as a dinner side dish, or enjoyed with eggs for breakfast! 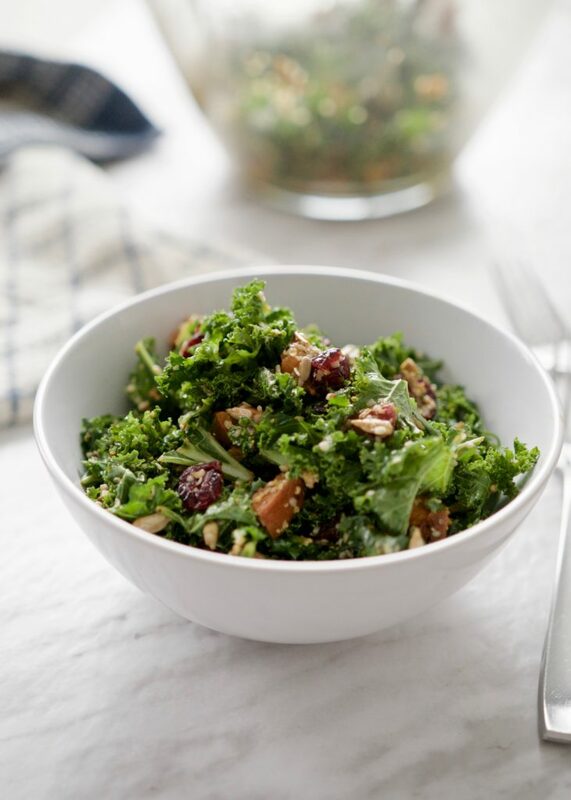 I’ve made several variations of kale salad over the years and this Sweet Potato & Cranberry Kale Salad is one of my favourites. 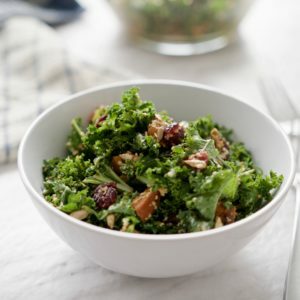 Kale makes a great base for salads because it’s so hearty and can withstand being stored in the refrigerator for a few days, often getting better as it marinates in the flavours surrounding it! Did you know that kale is a cruciferous vegetable in the same family as broccoli, cauliflower and cabbage? Cruciferous veggies are powerful and kale has a pretty impressive nutrition profile. Hormone balance: cruciferous veggies like kale contain a compound called indol-3-carbinol (I3C) that helps support estrogen metabolism and removing excess estrogen metabolites. This is good news for helping to reduce the risk of estrogen-related cancers. Calcium & magnesium: I always tell people that when you think of calcium, don’t think of milk, think of dark leafy greens! 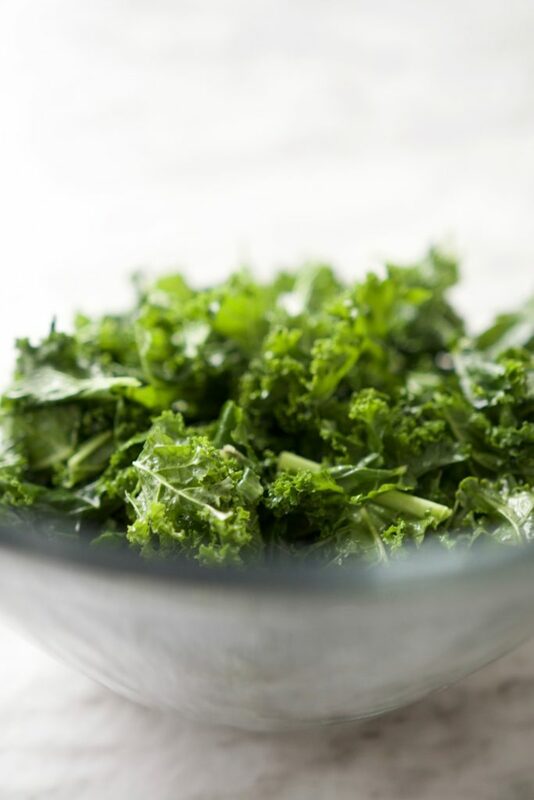 Leafy greens like kale are loaded with bioavailable (better absorbed) sources of calcium and magnesium, both of which are essential for healthy bones and heart. You’ll need to roast up some sweet potato for this recipe. I personally like the sweet potato (and this salad) with dried rosemary, but you can use any herb(s) you’d like. Try your best to find dried cranberries that are unsulfured and sweetened with apple juice instead of sugar, if possible. But don’t sweat it! I like the brand Patience Fruit & Co. Along with sunflower seeds, I also like adding protein-rich hemp seeds. 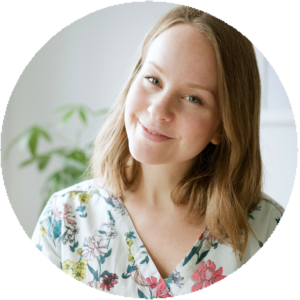 But feel free to use any seed that you’d like — this salad can be jazzed up in all kinds of ways. I also like using grainy/old fashioned mustard for the dressing, but you can also use Dijon for a spicier option, or another type of mustard of your liking. 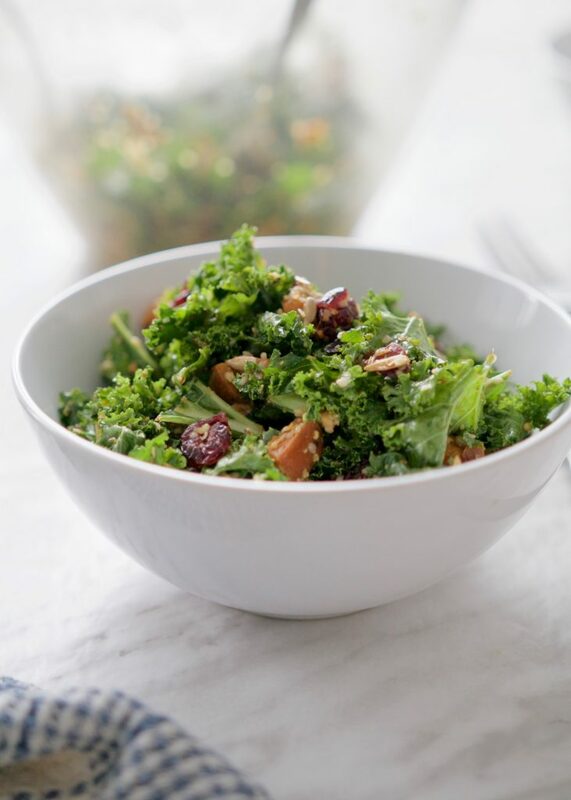 A simple kale salad with the perfect combination of sweet, savoury & satisfying. Begin by making your Easy Roasted Sweet Potatoes. In large bowl, add chopped kale and drizzle with olive oil. Massage firmly with hands until softened and dark green, resembling steamed kale. Add roasted sweet potato, cranberries and seeds to bowl and stir. Add in mustard and balsamic vinegar. You can toss these in separately and mix everything together, or whisk quickly in a small bowl beforehand. I find it works well just adding them in separately and mixing all ingredients thoroughly. Serve right away as a side dish, on it’s own, or with eggs for breakfast! Double or triple this recipe if you’d like additional servings. I hope you enjoy this salad as much as I do! Are you a kale fan? Let me know if you give this recipe a try and tag me on Instagram @meghanlivingstone with your creations!